Soil was loaded onto Spanish galleons traveling from Acapulco, Mexico, to Manila, Philippines, in the 16th century. The soil, needed for ballast on empty vessels, likely also included tropical fire ants, researchers report. Credit: Julie McMahon. Their study, reported in the journal Molecular Ecology, reveals that 16th century Spanish galleons shuttled tropical fire ants from Acapulco, Mexico, across the Pacific to the Philippines, and from there to other parts of the world. Today, the ant species is found in virtually all tropical regions, including in Africa, the Americas, Australia, India and Southeast Asia. The researchers were able to date the ants’ invasion of the Old World to the 16th century. 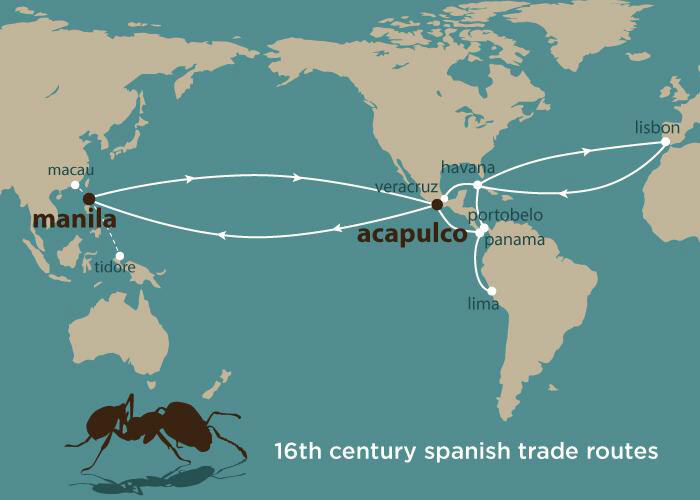 At this time, the Spanish had just established a regular trade route between Acapulco and Manila, Philippines, not only setting up the first trade route across the Pacific Ocean but also effectively globalizing commerce. “From there, Spanish galleons brought silver to Manila, which served as a hub for trade with China,” the authors wrote. “There was this very clear pattern where there was the most genetic diversity in the New World, where it’s native, and then you see these stepping stones of nested subsets of diversity as you move away from the New World into the Old World,” Suarez said. And the pattern of genetic changes over time “always overlaps the timing of when the Spanish trade was going on,” he said.